Product #45612 | SKU DRLED1000BX | 0.0 (no ratings yet) Thanks for your rating! 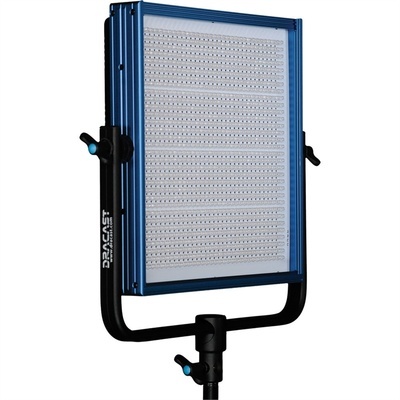 At 5.5 lb the LED1000-BX Studio Bi-Colour LED Light with DMX from Dracast is an ideal choice for the studio or location work where colour accuracy, control and flicker-free output are of major importance. Variable colour temperature from 3,200K-5,600K or anywhere in between means that you can quickly match the prevailing ambient or artificial light balance with a simple push of a button instead of using filters. Dimming is equally convenient via another button that adjusts the light intensity from 100-0% with negligible colour shift. Both values are displayed in a digital readout and can be controlled from a console via DMX. And the low electrical draw of just 60W means a timely return on your investment. The durable anodised aluminium frame is supported by an sturdy, U-shaped yoke with locking knobs on each side and a standard 5/8" receiver. This AC only version of the LED1000 can be used worldwide, powered by the included 100-240 VAC power adapter. Accessories include optional 4-way barndoors for contouring and control of the LED1000-BX's 45 degree beam angle.